Rosenblatt is a magical name in Omaha because of the popular mayor who belonged to it, the late Johnny Rosenblatt, who in his day was quite a ballplayer, and because of the municipal stadium whose construction he speerheaded. That stadium was named after him and became home to the College World Series. The subject of this story is his son Steve Rosenblatt, who inherited his father’s love for the game and followed the old man into politics. Fabled Rosenblatt Stadium is no more, replaced by TD Ameritrade Park as host of the CWS. The stadium, the series, and his honor the mayor are more than just tangential memories to Steve, they are lifeblood and legacy. 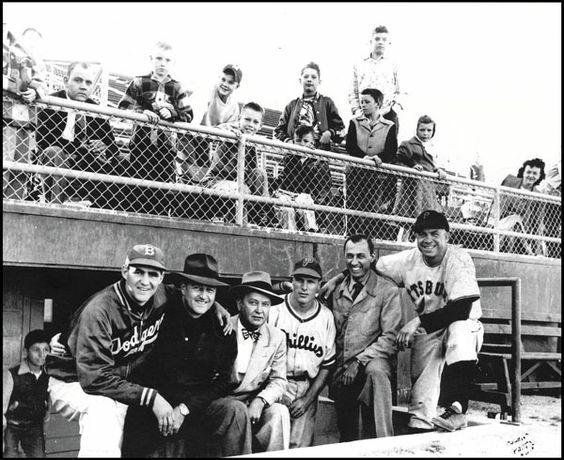 At the first game, from left: Steve Rosenblatt; Rex Barney; Bob Hall, owner of the Omaha Cardinals; Duce Belford, Brooklyn Dodgers scout and Creighton athletic director; Richie Ashburn, a native of Tilden, Neb. ; Johnny Rosenblatt; and Johnny Hopp of Hastings, Neb. Legacy plays a big part in Steve Rosenblatt’s life. The Omaha native and his wife, the former Ann Hermen, live in Scottsdale, Ariz.
His late father, Johnny Rosenblatt, became an Omaha icon: first as a top amateur baseball player; than as a sponsor of youth athletic teams through the Roberts Dairy company he managed; and finally as a popular Omaha city councilman and mayor. The elder Rosenblatt, who served as mayor from 1954 to 1961, led efforts to build the south Omaha stadium that became the city’s home to professional baseball and to the College World Series. The city he loved paid tribute to one of its greatest boosters when Omaha Municipal Stadium was renamed Johnny Rosenblatt Stadium in 1964. The venue and the name have become synonymous with the NCAA college baseball championship played continuously at the stadium since 1950. In a classic case of the apple not falling far from the tree, Steve Rosenblatt was a ballplayer in his own right and served on the Omaha Chamber of Commerce Sports Commission and the Omaha Royals Advisory Board. He followed his father’s footsteps into politics as well, serving two terms on the city council and three terms on the Douglas County Board of Commissioners. The stadium that’s forever associated with his father played a key role in Steve’s early life. He was a bat boy for the inaugural Omaha Cardinals game played there, a duty he performed the first years the CWS took up residence. He regrets that the facility so closely tied to his family will be razed after the 2010 CWS in line with the planned construction of a new downtown palace slated to host the Series beginning in 2011. But the pragmatic Rosenblatt knows the decision is driven by the bottom line, which trumps nostalgia every time. Sports and politics are inheritances for Rosenblatt, who is an only child. Just as his father used sports and charisma to forge a political career, the son used his own passion for athletics and way with people to become a player on the local political scene and to find success as an entrepreneur. Bearing a name that has such major import in Omaha could have been an issue for Rosenblatt, but he didn’t let it be. Growing up, Rosenblatt couldn’t help but notice what made his father a strong mayor and the sacrifices that job entailed. “I was aware obviously of it and I learned as time went on how he operated and how he did things. Of course it was intriguing. He was a people-person who had an ability to communicate and to have relationships with his constituency and to make the tough decisions and still maintain a tremendous popularity. He had what I would call a broad-based support. He was well liked all over the community and one of the things that contributed to that — and it was what also helped me — was the background he had in athletics. That benefited him as I think it benefited me. Being an accessible mayor means never really having any down time. The level of commitment required to be an effective, responsible public servant was not enough to dissuade Rosenblatt from seeking a seat on the city council and later on the county board. Even with the cachet of his name, his strong base in the business community and a groundswell of support to make a mayoral bid he never seriously considered running for that office. The same for a Congressional seat. He said it all comes with the territory. “Make no mistake about it, when a person is elected to office, even at the city level, the county level, there’s a sacrifice to be made,” he said. “People may not realize it at the time they do get in but they will find out. I found out and I knew how much I wanted to give and how much I didn’t. He never discussed with his father prospects for a public life nor went to him for political advice. Even though he never planned for it, Rosenblatt said he always assumed he would gravitate to public service. At the time he declared his candidacy in 1972 Rosenblatt was a salesman with Sterling Distributing Company, an alcoholic beverage distributor. He’d done some college work at the University of Nebraska-Lincoln and the University of Nebraska at Omaha. Only his mind was more on baseball than higher education. While school was hardly a home run, his experience trying to cobble together a college baseball career given him priceless insights. He also gained much from his friendship with two coaching legends — Eddie Sutton and the late Rod Dedeaux. Rosenblatt got to know Sutton when the then-Creighton University head basketball coach and his family moved across the street from Steve and his folks. The families remain close to this day. He got to know Dedeaux when the University of Southern California head baseball coach led his powerhouse clubs at the CWS. The ability to evaluate talent and to weigh options has made Rosenblatt a kind of scout and adviser for promising young athletes, especially Jewish athletes. Rosenblatt said it’s not an accident he’s drawn to strong, charismatic men like his father. After losing Johnny in 1979 Rosenblatt drew even closer to Dedeaux. 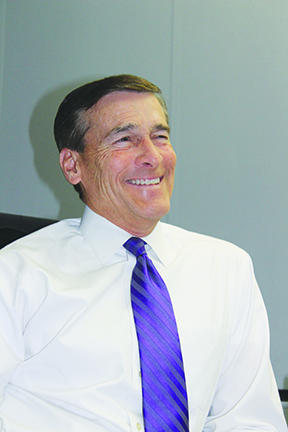 By the time Rosenblatt owned his own business — a sales and distribution outfit for corrugated package containers better known as boxes — Dedeaux and he were like father and son. They were also business associates. Rosenblatt parlayed his background in athletics by serving on the Chamber’s Sports Commission, which had a similar agenda as today’s Omaha Sports Commission. “It was a matter of trying to do the things that make Omaha an attraction for new athletic environments,” he said. Those enduring ties to the Royals keep Rosenblatt informed on the Triple AAA club’s uneasy status in town. Principal owner Alan Stein is in ongoing negotiations with the Omaha Sports Commission and the Metropolitan Entertainment Convention Authority that will determine if the Royals strike a deal to play in the new downtown stadium or go play ball somewhere else. La Vista and Sarpy County are among the Royals’ in-state suitors and Stein indicates out state communities are courting the team as well. Like any good businessman, he’s playing the field. 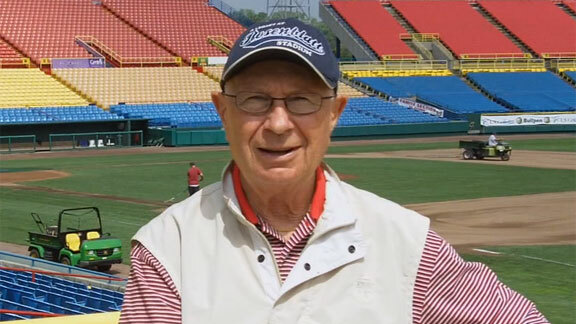 Steve’s personal connection to Rosenblatt Stadium and to the pro and college baseball tenants that have occupied it rather uneasily in recent years have put him in a Solomon-like position. He loves the CWS and how it’s grown to become a huge event garnering national media coverage. His long association with the Series and his deep affection for the figures who made it special give him a unique perspective. He knows players, coaches, local CWS organizers and NCAA officials. He sat in on negotiations between the city and the NCAA as a city councilman. “The city was a cooperative partner with the private sector in the production, basically, of the College World Series,” he said. He played a similar oversight role as a county board member. On the other hand he appreciates what the Royals offer the community and the compromises they’ve made to placate the city and the NCAA and the proverbial 900-pound gorilla that is the CWS. Just as he still talks with Royals officials, he bends the ear of NCAA officials, acting as a kind of intermediary between the two. It all came to a head when the political hot potato of the new stadium proposed by Mayor Mike Fahey, and subsequently approved by the city council, sealed the fate of Rosenblatt Stadium. The new downtown stadium is being built expressly for the NCAA and the CWS. If the Royals do play there they’d be the ugly step-child who has to accept the leftovers from the favorite son. Rosenblatt equates a Royals move from Omaha a loss. Even though he now takes an indirect role in such matters, he’s keeping a wary eye on the downtown stadium project, whose estimated $140 million price tag he considers overly optimistic. He predicts it will end up costing $175-$200 million once all the dust settles. Like many Omahans he’s concerned that if the Royals don’t play at the new stadium and no minor league franchise is secured in their place, the venue will sit empty 50 weeks a year and not be the economic catalyst or anchor for NoDo it’s intended to be. This longtime proponent of a CWS hall of fame said the stadium would be an apt home for it and an Omaha sports hall of fame. He also has a vested interest in seeing his father’s name live on in the new stadium. “In my opinion that would be wise and appropriate given the lengthy association that that name has had with college and professional baseball in Omaha. Hopefully the powers that be will have his name connected in some way,” he said. The stakes are rarely as high as they are with the stadium issue but he makes a practice of using sports as an ice breaker with people. Athletics and business were not his only finishing schools for a political life. He gained valuable leadership experience as a Nebraska Air National Guardsman and as chairman of the Midlands Chapter of the Multiple Sclerosis Society. Community service motivated his entry into politics. His action on some issues elicits satisfaction all these years later. One involved the Orpheum Theatre. Omaha’s then-mayor, Ed Zorinsky, wanted it razed. Rosenblatt, a fellow Jew and key ally, went against Zorinsky to side with preservationists who wanted it restored. The conflict came down to a close city council vote. If Rosenblatt and his wife have their way, they’ll eventually live in Omaha half the year. The Rosenblatt name could once again be center stage in the political arena.